Working with 24,000-plus-square-feet, Kilbourne Group and MBA Architects of Fargo have created a space housing everything wedding planners and event organizers would wish to have readily available for the perfect event: an in-house caterer, massage therapists, an event decorator, videographers, and a florist. These retail spaces within the venue are able to run independently, but benefit from a steady flow of customers from an anticipated 80 weddings and 40 concerts held on site throughout the year. With room for more than 600 attendees for standing concerts and nearly 300 for wedding ceremonies, the building is poised to continue serving the Fargo community as it has for over a century. For more information visit Sanctuary Events. 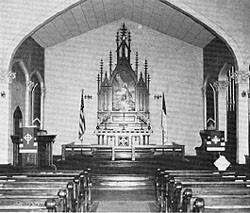 The St. Mark’s property hosted its first structure in the “frontier” days of the 1880s when the United Lutheran Church in America commissioned an English-speaking church be constructed in Dakota Territory. At that time, services in the area were held in “foreign tongues,” primarily Scandinavian. Before ground was broken on the southeast corner of 8th Street and 4th Avenue North Reverend Ulery taught Sunday school classes in English at the Fargo and Southern Railway Depot, all in effort to recruit a small following to be his future congregation. For two years, Rev. Ulery held classes in the station’s waiting room until he could procure the funds needed to buy land and build a church. 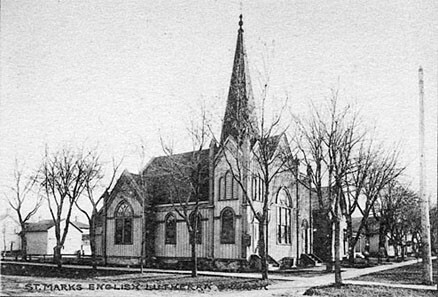 After more than two years in the rail station, and five years of planning, on May 18, 1887, St. Mark’s English Lutheran Church held its first service. 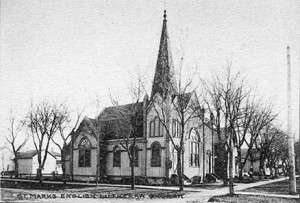 It was the first Lutheran church to use the English language in Dakota territory. The structure that stands today, however, is not the one of Rev. Ulery days. 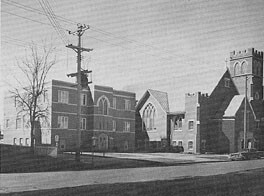 By 1912, the congregation had grown to 300 members and the old church was torn down to make way for a larger one. It saw expansion once again in 1952 when an education wing, costing nearly $100,000, was added on to the church under the leadership of St. Mark’s tenth pastor, Rev. Ingold Kindem. 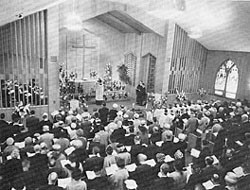 At its height in 1960, St. Mark’s had an estimated 1,200 members. But, after serving parishioners for more than a century, the people of St. Mark’s decided to sell their building in 2013 due to an inability to maintain the aging structure. Realizing the vital role that St. Mark’s plays in Fargo’s history, and wishing to save it from demolition, Kilbourne Group purchased the building in October 2013. St. Mark’s will resume a role that it’s played since its foundation, as Kilbourne Group invested an estimated $4 million to renovate the property into a wedding-centric event venue.